In Seth Godin's classic Purple Cow: Transform Your Business by Being Remarkable he explains how in today's world, if you're not remarkable, chances are you won't succeed. Gone are the days when the traditional P's of marketing and a huge advertising budget guaranteed success. Today, with all the constant media noise, it takes something different to get a consumer's attention. This something different is a purple cow. As Seth explains, a cow gets boring after you see a few but a purple cow, because it's so remarkable, is memorable—at least for a while. So whatever your product or service, you need to be remarkable. Don't try to aim for the masses since that's probably been done; instead, aim to be different—to be remarkable. Better yet, figure out who the "sneezers" are in your niche: the early adopters who love finding and trying something new and then spread it to their friends. Market to the sneezers and you're golden. And what helps make a purple cow is building the remarkableness into the product or packaging itself, instead of trying to do it with advertising after the product is developed. Involve your marketing team from the start and you'll have a better chance at a true purple cow. Seth also explains that even purple cows stop being remarkable after a while, so milk them for what they're worth and then find another purple cow. For someone who's fairly new to the world of social media and digital marketing, this was a very interesting and informative read...and in some ways equally discouraging. Being remarkable isn't easy and I'm not sure it's for everyone. It takes seeing things differently and understanding how you can revolutionize an industry, product, or service. I guess it's how you define remarkable. If you find something you're really good at and hone that skill, you can be remarkable at that. Even if you don't become famous or filthy rich, those that need that skill will find you based on word of mouth. And that may be all many of us aspire to. How remarkable do you aspire to be? The more time we spend with friends, with being optimistic and happy, and by being around other positive people, the happier we'll be. And doing for others and spending on others actually energizes you more than doing them for yourself. There's also a cumulative advantage to the positive charge you give someone by instilling confidence in them, so encourage your children early. Part of this is helping someone see the potential in themselves that they may not be aware of. Tom shares the touching story of writing his grandfather, Don Clifton, a letter before his death so that he knew how much he and his influence meant to Tom. After reading this letter not only did Don realize that Tom had a way with words, but he then asked him to help share his story. How Full Is Your Bucket? was the result of this, as was Tom discovering a strength he would not have known otherwise. The flip side of this is ignoring a strength since it's not "profitable." Do you have something that comes naturally to you and/or that you enjoy doing? Is it something you do for work or for fun? If the latter, do you recognize it as the strength it probably is? Or do you ignore it because it can't help you make a living? I've written to some extent most of my life. I got a BFA in Creative Writing, spent enough of my career and MS in Publishing writing papers, have started and stopped other blogs in the past, and write countless e-mails and business communications daily. But I did not consider myself a writer, or writing a strength, despite my current blog and other publications since I don't get paid for them. Given how much I've learned by writing and how much I gain, albeit in non-monetary ways, I'm embarrassed that I did not connect the dots for myself earlier. So learn from my mistake. What strength(s) of yours are you blind to? As per the Thomas-Kilman Conflict Mode Instrument (www.cpp.com), which we had to take for the Jack Welch EMBA Leadership class, there are 5 conflict-resolution styles. 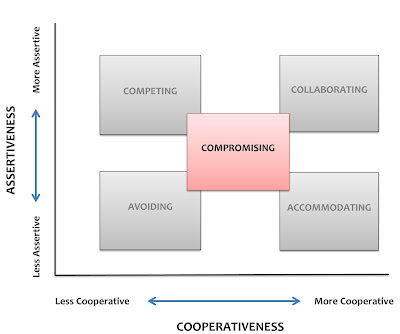 As you can see from the chart above, these five are plotted on two axes: assertiveness and cooperation. compromise, they are somewhat assertive and cooperative. My default method seems to be to compromise, with collaboration in second place and avoidance in last and with a very low score. But as the assessment report points out, every type has its use and instances where it's actually the preferred method. For example, avoidance is good when there's a more important issue that needs to be resolved first or when emotions need to cool down before a conversation can be productive. Compromise is good when you're under deadline but collaboration is better for long-term solutions. Even competition and accommodation have their places: competition for emergency situations and accommodation when keeping good-will is most important. There are more examples for each and it made interesting reading. It's also been interesting taking all these assessments for class, and both discussing and considering how the results influence my leadership style. In both cases the profile reports have gone to great lengths to explain that there is no right or wrong style, nor a preferred one, but that knowing oneself better will allow us to be more strategic in how we interact—and resolve conflicts—with others. What was the last personality assessment you took and was it helpful? And what's your preferred conflict-resolution style? I recently tried to explain to someone who is all about automation that even the best processes occasionally require human intervention. Today it was my chance to experience this. So even with a month's backlog of drafts and having gotten the hang of Buffer, life happened and I forgot to hit publish, so today's post and shares did not happen. I guess it's not a bad thing that us humans are still needed and that not everything can be automated. So sorry for the missed content but back again on Friday. I had to read the Harvard Business Review article "The Discipline of Teams" by Jon R. Katzenbach and Douglas K. Smith for my Jack Welch EMBA Leadership class. Since I now work part-time for a fully remote company, and manage and interact remotely, the above made me realize that if virtual "teams" were true teams, their being virtual would be less of an issue. Unlike in an office where you can easily stop by to check-in, communicate, and track progress, it takes effort when everyone is distributed. So if you establish the virtual team with the five "team" principles from the get-go, that effort will be minimal. Get buy-in from each hired member on the team's purpose. Make sure they're aligned and let them personalize it a bit so they feel it's truly theirs. Use this shared purpose to come up with the team's performance goals, then add individual goals based on each member's personal purpose. Hire for a mixed range of skills, not those that are just like you; know team members' strengths and weaknesses and try to fill the gaps. Get buy-in on who does what, how this will be shared, and at what frequency. And everyone should hold everyone accountable to the above. As you can see, by hiring correctly for a virtual team, setting proper expectations up front, and then holding everyone accountable to these, it will be as easy working remotely as in person. Have you lead virtual teams? Any other tips to offer? Stress is a scary thing and can cause people to act and react out of proportion. We've all had times in our life when we're dealing with a stressful situation. If you're lucky, you have friends and family helping you get through this time, but if you're not careful, and snap at them due to the stress, the people you need most may be driven away. If you find yourself going from zero to a hundred too quickly and/or just yelling more often than is normal, really stop and take a deep breath. Spend some time alone figuring out what is the trigger. Yes, the stress...but beyond that, what? Did the person say something that touched a nerve? Did they react in a way that you're oversensitive to given your circumstances? Knowing what set you off may not make it go away, but will hopefully give you enough insight to not drive all your support away. Have you seen this happen or been a victim yourself? What helped you? We've discussed how a dysfunctional culture erodes productivity earlier. If employees are busy keeping themselves safe, they won't be focusing that energy on getting work done. Another aspect of this is fear of sharing bad news. I just watched a video where a CEO explained how important it is to get bad news quickly so that you can react. He is trying to inspire a culture where there are no negative repercussions for sharing bad news, nor is it followed by examining the mistake to death. Instead everyone deals with how to fix it and moves on. I unfortunately remember too many times where instead of just sharing something, I had to first figure out how to frame and time it so that the response would be a productive one. In hindsight I consider that a failure in leadership and culture. It is an employee's job to do their work well and to communicate with you, their leader, both the good news and bad. If they have to fear repercussions, or even think twice about telling you something, you've failed to instill a culture of trust and communication. If you as their leader are candid and transparent, and if you have reacted appropriately to bad news in the past, they will trust you not to punish the messenger in the future. But all it takes is one wrong word or move to break that trust. So next time someone shares something unfavorable with you, be very careful of what you say and what your expression and body language say. Part of being a leader is understanding that everyone looks to you for guidance. They watch your every move and reaction, so be sure you are relaying the message you want and that is aligned with the culture you want. Have you had to worry about sharing bad news? If not, how was your trust earned? There are some things in life that have distinct stages with very distinct challenges. For instance, parenting. Someone may love an infant and be perfectly equipped to handle the sleepless nights along with the cuteness but cannot handle the complications of a hormone-ridden teenager. Or someone may be the exact opposite and prefer the teenager, hormones and all, since there's two-way communication, unlike with the infant who can't talk. Entrepreneurship is the same. Some may love idea generation and the joy of coming up with something new, building a team, and launching it. Others may prefer to research the idea, test it, and then hand off the launch. And a third prefers more structure and is all about scaling. Each distinct stage of a startup's life requires very different skills and mindset. That's why many startup books caution that a founder is not always best suited to take his or her idea past a certain point. There are exceptions, of course, and a founder all about learning may be able to see their idea through, but most are not and need to know what they're suited for. What types of challenges inspire you? Do you like an environment where everyone is wearing all hats and chipping in to get things launched? Or do you prefer more structure, with defined roles? Do you prefer to be doing it all yourself and/or in charge of it all or do you prefer to lead through others? If you do not know what stage entrepreneur you are, you are dooming your startup, so take the time to think it through. And if you're not sure, pay attention to which parts of your day-to-day excite you and which enervate you. So what stage entrepreneur are you? Happy Labor Day weekend to all. Hope you have a well-deserved, restful long weekend and get to recharge. Back on Wednesday with more business common sense. It's amazing how many different theories, books, and systems there are to describe what it takes to be a good leader. I've read (and written about) quite a few but one that has withstood the test of time is emotional intelligence (EI), invented and written about by Daniel Goleman. As Daniel and his fellow researchers proved, high IQ may be a prerequisite for leaders but a better test of whether they will succeed or fail is high EI. The first three are all internal: being aware of how your emotions and actions effect others; being able to control your inappropriate reactions; and a drive to achieve that is beyond monetary and can withstand challenging times. The latter two are external: being able to read others' emotions and being able to build relationships. I would go farther and say that leaders have to be aware and care. how others are reacting and feeling. And if they care, they will then act accordingly and appropriately. Without the awareness, even if they care, they will not be acting or reacting appropriately. With the awareness and without the caring...well, that could potentially lead to manipulation and evil. Luckily, awareness can be honed but I'm not sure whether caring can. What do you think? Can a leader be trained or is it something one's born with? I was just rereading the Actionable Book Summary I submitted on Tom Rath's Are You Fully Charged? The 3 Keys to Energizing Your Work and Life, and the part about how being positive affects those we love struck a nerve. We all have to remain positive and careful not only in our demeanor, but also in the words we choose. Especially in an age when so much communication is via text—whether e-mail, phone texting, or some collaborative communication tool such at Skype or Hipchat—words can so easily be misconstrued. Imagine this scenario. Someone asks or does something that inadvertently pisses you off. They've done nothing inappropriate but unfortunately have bad timing. Instead of just spewing your crankiness at them via a quick and to-be-regretted response, take a walk or a deep breath and think twice. Is it worth spreading your negativity and ruining someone else's mood? Or even if someone did something you consider wrong, there's a way of expressing your concern and criticism that is appropriate and constructive and there's a way that's definitely not. Imagine a peer's team member makes a request that you believe is redundant and wastes your time. You can quickly send a curt e-mail taking umbrage at your peer...or you can take a minute to catch some perspective and calm, and realize there is probably more to the situation. Instead of spreading negativity and creating friction, ask instead of assume and work together to come up with a solution. Words are powerful: they can wound or heal; they can inspire or demoralize. They can make someone happy to be a part of your team and willing to go the extra mile to help you...or they can make someone wish they were anywhere else but around you and your harmful words. Which kind of energy would you prefer to be around? Which kind of energy are you sharing?